Durable white color lightweight hollow molded soft plastic costume accessory. Ideal for prop building, graveyard haunt, cemetery scene, pirate prop or funny anatomical display. 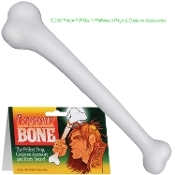 Make no bones about it - this prop is fun and creepy! Approx 16-inch (40cm) long x 4-inch (10cm) wide at widest and 1.25-inch (3.13cm) at the narrowest.